Obligatory preamble rambling: When we were renovating our kitchen, I searched high and low for any information I could find on Ikea kitchens. The results were few and far between. 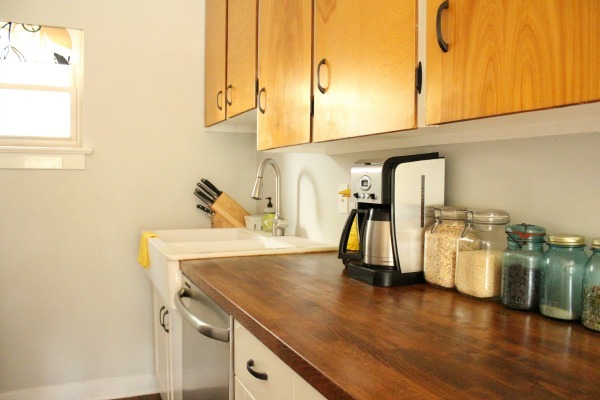 We did end up with an Ikea kitchen (which we love) but I’d like to shed more light on Ikea kitchen renovations from the perspective of other real life homeowners. It’s something I wish we would have had access to when we were considering Ikea for our own kitchen remodel. 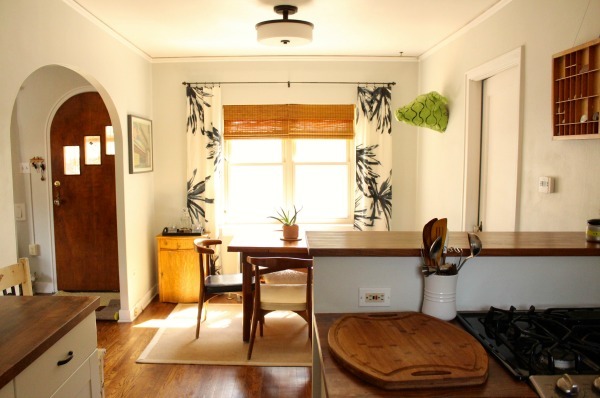 Plus, it’s fun to see how others use Ikea to suit their personal style and needs in the kitchen. I hope you find these posts helpful and inspiring – whether you ultimately end up with an Ikea kitchen or not. Enjoy! Marie and her fiancé (now husband) snatched up a HUD foreclosure in 2012. The 1930s bungalow in Denver, Colorado, was outdated but the couple was able to see past the shag carpet, linoleum flooring and faux brick wall covering. 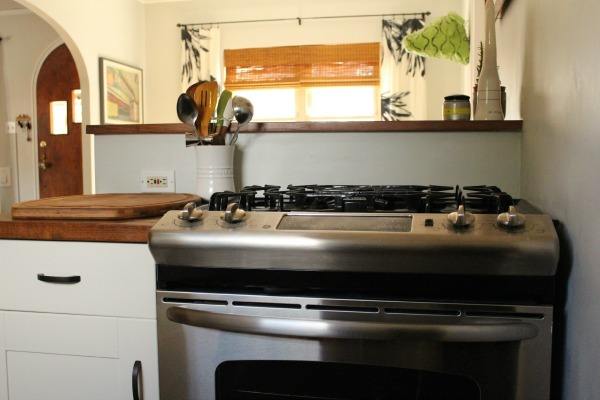 Using a combination of imagination and elbow grease along with help from an outside contractor, they revamped the dark and cramped kitchen into a light-filled and functional space that exudes nothing but warmth. 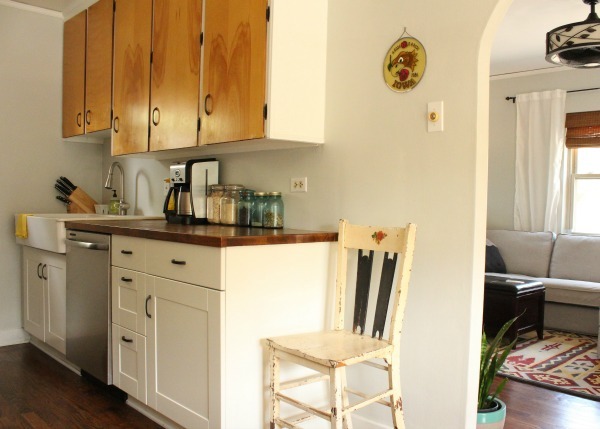 In an effort to modernize the kitchen without completely wiping out the home’s historical character or the couple’s bank account, Ikea cabinetry was mixed with original cabinetry. I asked Marie several questions about the renovation. Find her answers and the charming “afters” below. Which items in your kitchen hail from Ikea? Most of the new parts of the kitchen are from Ikea: the lower cabinets / doors / drawer fronts, sink and butcher block countertops. What made you decide to source these items from Ikea? Ikea’s prices were definitely a draw but we also looked at several other options. We were impressed with Ikea’s quality by comparison, and the aesthetic balance of more modern cabinets that also fit in well with our older house. Soft-closing drawers were a nice bonus, too! Who designed your kitchen? What aesthetic were you aiming for? We designed it ourselves. We love the details of our bungalow and wanted to maintain its historical integrity while opening it up and streamlining things. I used Google SketchUp to render cutting out the wall between the kitchen and dining room and adding the breakfast bar. We knew generally how much space we’d have for the lower cabinets and for one next to the stove and found five different sizes of Ikea cabinets to fit those spaces. Several parts of the design were set by the architecture of the house, its size and its age. You might have noticed there’s no refrigerator? It’s actually on the other side of the doorway on a platform over our basement stairway. This may have been somewhat common in the 1930s. My dad’s childhood home was built then and he remembers a similar arrangement. We briefly tried to design the space to turn the fridge and have it open into the kitchen but it wouldn’t work for several reasons. It’s a load-bearing wall, for one, and would have been a much bigger deal to remove than the wall we ultimately took out. Also, the oven and refrigerator doors wouldn’t have cleared one another. We realized that we liked the more minimal look of the space without the refrigerator. By now, we don’t even notice the extra step around the corner and just remember it when people come over, look confused and ask where our fridge is. Did you assemble and install all Ikea kitchen components yourself? If not, what did you seek help with? We assembled the cabinets and drawers, added the hardware and stained the countertops. Our contractor built the breakfast bar, and he and our plumber installed the lower cabinets and countertops. How did you customize your Ikea kitchen to suit your needs and preferred aesthetic? Because we were on a tight budget and encountered a few other bumps in the renovation process, we were happy to reuse whatever we could. We kept the upper cabinets, which are probably original, with doors likely from the 50s, as well as the hardware. The original lower cabinets weren’t deep enough to add a dishwasher and the formica countertop was in really rough shape. I probably would have tried to save them otherwise but am glad they had to go. The Ikea cabinets offer so much more storage and don’t stick like the old drawers did. The cabinet handles and hinges had a faux copper finish in their prime but were discolored and peeling. We scrubbed and spray painted them to match the metals on the bar stools and the workbench and put them on the Ikea cabinets to connect the old and new. The arched handles also echo the house’s architectural details: our fireplace, front door, and the doorway to the living room are all arches. We stained the countertops to match our floors. We used two different types of Ikea butcher block countertops for the main counters and the bar but, once stained, they visually blend pretty well. Staining obviously made them not food safe so we use a cutting board next to the stove for all food prep which also saves the countertops. It’s been nice not to worry about coffee stains. They wipe right off or blend right in. I made the window valance with a fabric remnant from Ikea’s as-is section. This window is on the back of the house and is high off the ground so we just wanted something simple to cover part of the vinyl casing without blocking natural light. How long was it from design to the final product? We closed on our house in April 2012 and moved in at the end of May 2012. We were working with a contractor on several projects to get the house in livable shape. It was a HUD foreclosure and the previous owner had lived here for over 50 years. Most of the bones of the house were in wonderful condition in part because so much was layered on top of them. For example, there were five layers (!) of flooring over the original wood in the kitchen – enough to create a step up into the room. Our contractor removed the old linoleum and tiles (which were all tested and thankfully free of asbestos), took out the wall between the kitchen and dining room, and we had the glue-covered floors sanded and refinished. You can still see some of the staples from a plywood subfloor that was layered over the hardwood. The staples were too weak to pull out so were sanded right down. Our floor glitters thanks to them. When we moved in, the major structural elements were done: cabinets, plumbing, and appliances were in place, the wall was down, and the floors and countertops were finished. After we moved, life got really full. Between our wedding, a surgery, work, and more pressing renovations, we were just glad to have a place to land and share a meal. We didn’t paint for almost a year! After another year we had the ceiling patched and got a new light in the dining room and also moved the current kitchen light up from the basement. I finally found a close match for the original picture rail moulding and hung it this spring. We’d love to add a backsplash at some point but haven’t figured out how to navigate the different lengths of the the top and bottom cabinets. So we painted it and have actually liked the visual continuity of the paint. It’s an eggshell finish so stains and splatters wipe off easily. We’re calling it done for now. 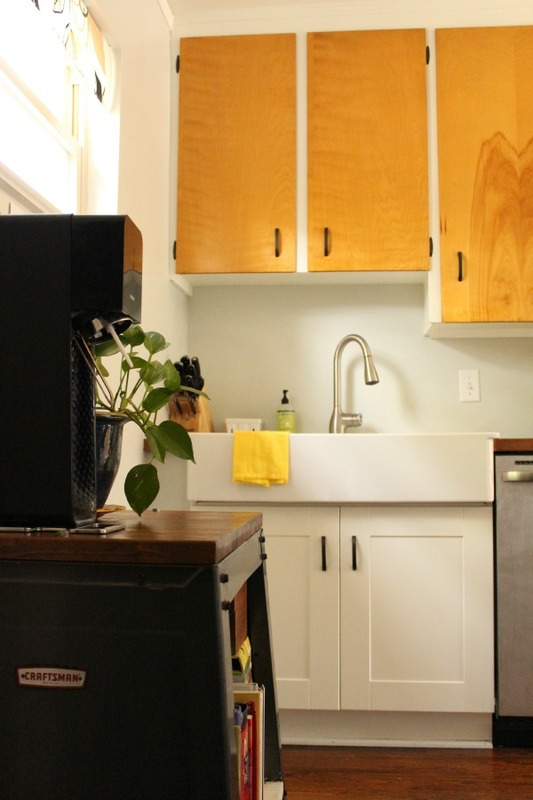 How long have you lived with your Ikea kitchen? Have you encountered any problems? We’ve lived with the kitchen since June 2012. We upgraded our faucet from the first Ikea fixture this spring. To be fair, it was one of their lower-end ones and has since been discontinued. My husband does a lot of home-brewing so we’re not sure if the pressure and pull from brewing hoses and attachments was too much, or if the fixture itself wasn’t that great. Either way, it was warped and wobbly and leaked in spite of several attempts to fix it. Out it went. The new one fits the space better so it was all for the best. What is your favorite thing about your kitchen? Least favorite? I love the size of our kitchen which might sound strange since it’s just barely 8’ x 9’. It takes no time to clean. Everything is accessible and food can’t get lost forever or waste away in a forgotten pantry cupboard. It’s taught us to keep and use only what we love and need. When we opened the kitchen up to the dining room (which is also about 8’ x 9’), the flow of the house completely changed. We get so much more natural light all day from the living room and dining room windows. It’s a small space but has made the whole house feel so much more spacious and welcoming. When we have friends over, everyone gathers here. My least favorite thing has nothing to do with Ikea but the base of the dishwasher sticks out about an inch because our 80-year-old floors aren’t anywhere close to even. To keep the dishwasher level so it doesn’t leak, and also to level the cabinets so the countertop is straight, they’re not aligned. While it catches my eye, I’m just glad it worked out. Adding a dishwasher was a huge upgrade for the house. Would you recommend Ikea as a source for a kitchen remodel? If so, which items? Oh, absolutely! The cabinets, drawers, countertops and sink have all been wonderful. We especially liked the variety of cabinet and drawer widths Ikea offered. 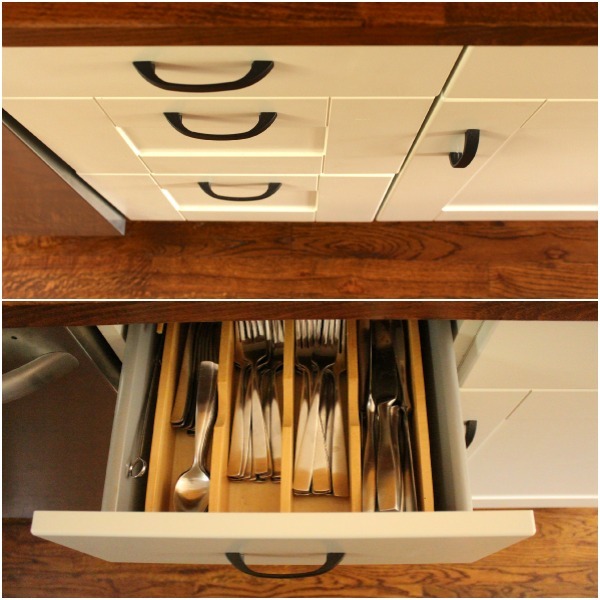 We could easily configure doors, shelves and drawers in a way that made sense for a surprising amount of storage. They hold everything from serving trays to our Kitchen Aid mixer. We use one upper cabinet for food storage. The others are all for kitchen supplies. We only have one small box in the basement for kitchen overflow – cake pans and other things we use seasonally. 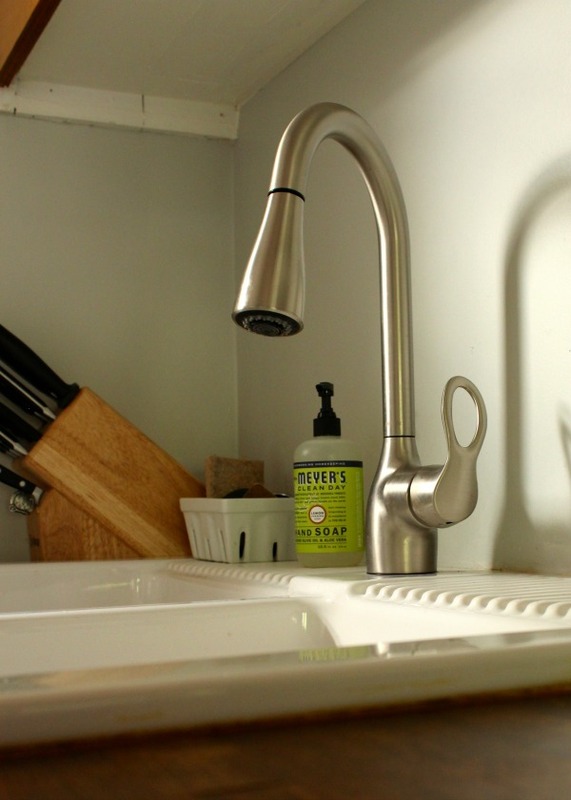 The double-basin ceramic farmhouse sink is also a great feature, especially for a small kitchen. It can take whatever we throw at it or soak in it, and it still looks new. Would you consider Ikea for a future kitchen remodel? Definitely. Since the kitchen, we’ve added Ikea cabinets, sinks, and faucets to our bathrooms and have been impressed with their quality as well. We are expecting our first baby any day now and, while we love our little house, we’re not sure we’ll be here forever as our family grows. Wherever we wind up, it’ll most likely be another project. We both grew up in older houses and the renovation process makes us feels at home. We would use Ikea for another kitchen in a heartbeat. Thank you so much, Marie, for sharing your charming kitchen! This is such a warm and inviting space, isn’t it? It makes me want to pour a mug of coffee and linger. There are so many good takeaways. First of all, the mix of old and new cabinetry suits the historical character of this home. It just wouldn’t feel the same if all the cabinetry were new. Opting to keep the upper cabinets saved the budget, too. (We actually have friends who did the same thing in an older home. They opted to mix Ikea cabinetry with their home’s original cabinetry and it worked out surprisingly well.) And the decision not to change the location / accessibility of the refrigerator? If it ain’t broke, don’t fix it. Removing the wall between the kitchen and dining room and adding a breakfast bar made a world of difference in how the space looks and functions. Deliberate details – like the upcycled hardware, industrial workbench, stained countertops – help tie the space in with the rest of the home for a cohesive look. The couple’s resourcefulness can’t be overlooked either. Consciously reusing materials is smart, eco-friendly and inexpensive. To know Marie’s favorite aspect of the kitchen is its small size is so inspiring! Most people I know would turn their noses up at a kitchen this size. There’s something to be said for living with less stuff and greater awareness. You’ve probably heard by now that Ikea will be phasing out the AKURUM cabinet system and introducing a new line next year. Many customers are up in arms over the “secret” transition. Ikea says it will continue to honor the warranty on AKURUM cabinets while providing new and improved features within the SEKTION line. I like change – especially when it involves betterment – but am curious to see how the transition plays out. I imagine Ikea kitchens will remain a force to be reckoned with since many of the beloved features (standard soft-closing drawers, wall rail installation, budget-friendly pricing, ease of customization, etc.) are staying. I would love to continue the Ikea kitchen series if you think it’s relevant. Thoughts? Love the style of this house. Does she have a blog? I looked for a link to one and maybe I just missed it? Thank you! I absolutely love this series! I never tire of checking out peoples kitchens and since our kitchen will need to be redone at some point I’m always filing away little bits of information gleaned from these pieces. I love this series and I think this Ikea kitchen is probably my favorite. (Though I do tend to say that about all of them.) We are planning a move to a small house and this kitchen’s size is perfect. Do they have a website or pinterest? I’d love to see pics of their IKEA bathroom renovations. I love this series. I hope to purchase an older home in the next couple of years and I know work will need to be done. It’s nice to see a “real” Ikea kitchen vs just the models in the store. I always felt that Ikea was just pretty particle board that wasn’t built to last. Will be looking fwd to see how this holds up to the wear and tear that kitchens go thru. Great mix of old and new! Having just installed Ikea butcher block counters in my own new Ikea kitchen, I’d love to know what Marie used to finish them. We used Howard’s butcher block conditioner and it’s not getting that darker glow that makes Marie’s counters so beautiful. I believe Marie mentioned that they stained the butcher block with Minwax’s walnut stain. Not sure was sort of top coat was used. Hi Jessica~ Thanks so much! We lightly sanded down the Ikea finish and used Minwax Walnut for the color originally. We’ve used Howard’s conditioner and plain mineral oil to condition it, at first daily until water would bead on the top, and since then we wipe it with oil about once a week. I’m so pleased they went halfsies on the cabinets. My first thought looking at them was that I actually quite liked them, but that it was a little overwhelming because the contrast between the wood front and white outlines was very busy. I think this does a great job of looking clean and updated without looking too on the nose of current trends. Even though there are trends, there’s something neutral and effortless about their integration. 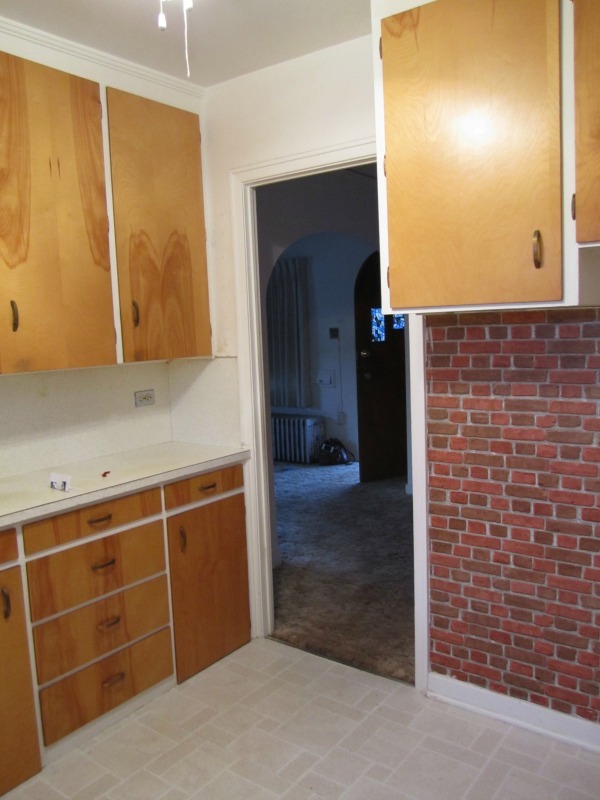 I really like the original cabinets on top, too! They suit this home so well. I think it’s incredible how such a small thing, using the original hardware on the new cabinets, can make the mix so intentional and seamless. Wow, great job Marie. Amazing before and afters. I would love to see more of the house. What is the square footage? Do you have a blog? Congrats on the new arrival. Many thanks, Alison! No blog at this point, but maybe someday? I’d be happy to share more photos if Dana does an Ikea bathrooms series! (just a hint!) The upstairs is about 750 sq ft. The whole house has about 1250 sq ft finished- we also renovated the basement to add a bathroom and bedroom. I bet the rest of it is just as cute, too bad we can’t see it. Maybe Dana would do a house tour on your house. I really like rescued little old houses. I think so far this is my favorite Ikea kitchen featured because it truly is a work with watcha got kitchen. Love it! I wasn’t sure about keeping the old cabinets, but it works. Just took some getting used to. Also, did you know that IKEA is getting rid of their current series of base cabinets (Akurum) and getting new ones in the new year? Not sure if they will be interchangeable, but something to keep in mind if you’re planning to build a new kitchen in the near future. I mentioned the new cabinet line from Ikea at the end of the post along with a question to readers if they think this series is still relevant given the new line is not interchangeable. I’d love to see your kitchen’s transformation! And please keep the series going! We’ll be doing a new kitchen once we move, again, IKEA. Even if you can’t get EXACTLY what is on the pictures, I love it just for the inspiration. I love this series! I am not in the market for any kitchen work or new cabinets but I love to see the transformations! Are you planning a post on the new Ikea cabinet system coming out next year? Any inside info to offer? I would love to hear how the new line compares to the current, especially from someone who has lived with an Ikea kitchen for a couple of years now. Can’t wait to see what new fronts will be offered. Wow. This kitchen looks incredible! SO much character, and so tasteful. 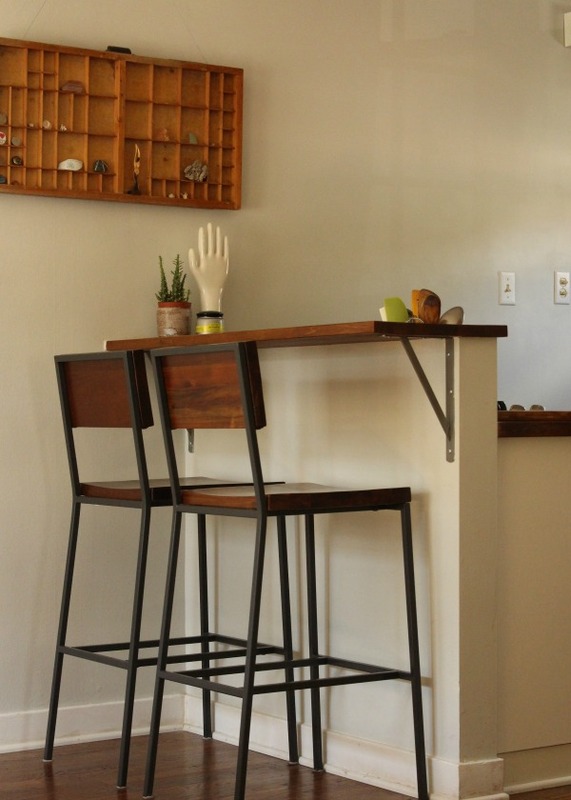 And those bar stools? So on point. We also have a small galley kitchen in our 50’s raised rancher. When we first moved in, I thought the small size was unfortunate, but now I love my little kitchen! Couldn’t imagine anything else. Cooking and cleaning are a breeze with everything close by and it also keeps me from buying “stuff” that I really don’t need. YES, please keep the series. I sent you my Ikea kitchen remodel around March of this year hoping it would be featured, and now sadly we are moving to a new home and I have to leave my dream kitchen and start over with a much smaller outdated kitchen. It’s the only part of the move that brings me to tears because so much of me is in the kitchen remodel. We will definitely do Ikea cabinets again but are not sure how long we have to live with the current one before we can save up for it. In the meantime all the Ikea features are giving us ideas. The kitchen above is so incredible! Thanks for sharing. No problem :) You warned me it could take a while. I really love this series and can’t wait to see the new IKEA system! LOVE this series. Inspiring and helpful. Please keep ’em coming. Thank you Dana! Marie your kitchen has just gone into my top 5 favourite kitchens. It is beautiful and timeless. I love your philosophy of living with less. And congrats on your little one coming! Wow, what an upgrade! This post makes me want to start renovating my kitchen right now! Looks great! So bright and warm. Question unrelated to the kitchen: from what I can see of it, I really love the console that is holding your tv in the room adjacent to the kitchen. Would you mind sharing the source? Hi Carrie~ Thanks! The console is also Ikea, but was actually a lucky curbside find, left behind when one of our neighbors moved. It’s the “Magiker” series, but I don’t know if Ikea still makes it. We replaced the original knobs with the brass ones. Yes – relevant and I love reading about and seeing photos of what others are doing. Keep it coming! I love this series! We’re buying a house that we plan to put an ikea kitchen into. I love seeing what other people do to their spaces. I’m thinking we’re going to go with the Appkåd doors. Has anyone else used them? Definitely relevant! Sadly, the couple who owned our house before us divorced, but not after they had torn out the old kitchen and some random walls. 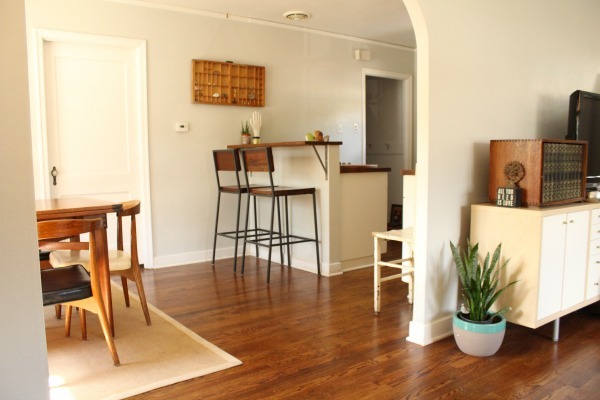 They bought some ill-fitting (for the space, but it’s all very nice individually) Ikea freestanding kitchen cabinets and turned it into a rental. There’s a lot of unused and unusable space. Even though they don’t fit the space, I’ve really been impressed with the quality and looks of the Ikea cabinets. When we finally decide to completely redo the kitchen/living/dining floor plan, I would love to have some new Ikea cabinets. I enjoy seeing other Ikea kitchens for inspiration, so thanks a bunch for the series. Sorry for the ramble. Thank you so much for sharing this kitchen! We have an original 1960s kitchen in our place and this is helpful for picturing how our cabinets would look with black hardware, and how a “tuxedo style” paint job would look. We are considering dark gray for our lowers as they are extremely scratched, water damaged and beat up, with the original doors up top (they have a gorgeous wood grain). Again, thanks!! Please continue sharing Ikea kitchens, even (especially!) after the switch! We’ll need just as much info about how the new line works out, if not more. 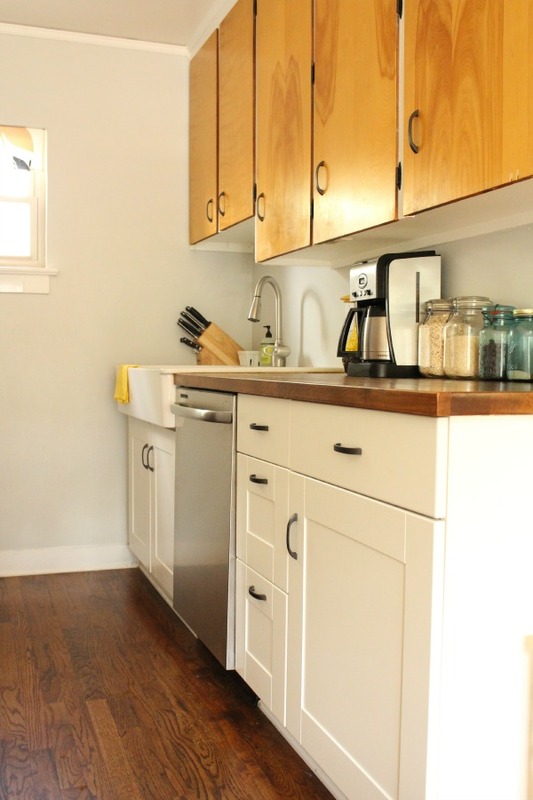 Such a helpful post as we have debated IKEA cabinets in a kitchen remodel. Thank you for this and the previous posts in the series! Love the IKEA series……I mean, REALLY love it. So, I have a question for Marie. We are also thinking of redoing our kitchen and knocking down a wall between our living room and kitchen. 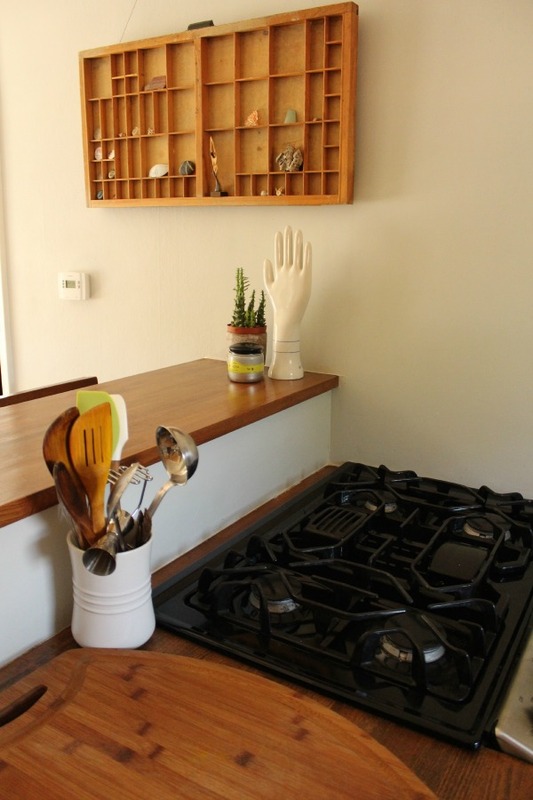 The set up would be the same as yours….with the stove against the breakfast bar. Do you like having the breakfast bar raised, so the stove has a backsplash? 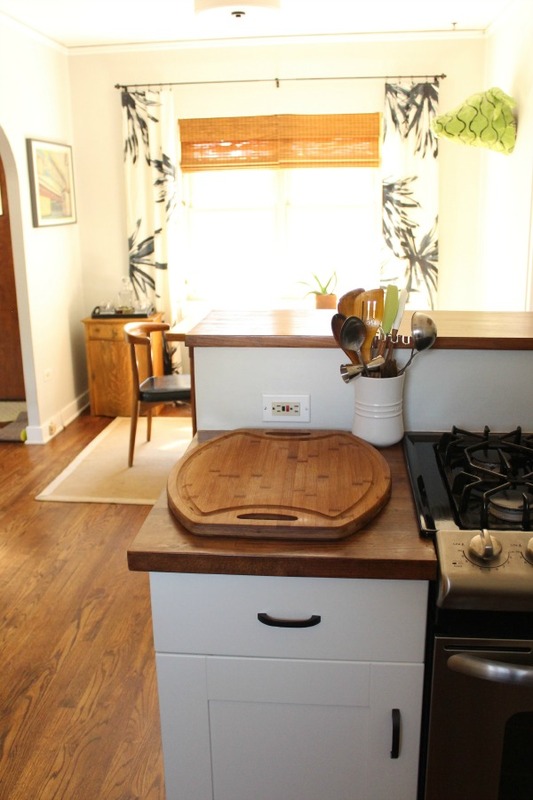 We are considering having the whole thing counter height with the stove as just part of the counter……I worry about cooking splatters and other unforeseen issues. Did you consider making the breakfast bar counter the same height as the stove and kitchen countertop? Do you like it raised? Just looking for some real life experience. Hi Robin~ We really like having it raised. It’s convenient for sitting when someone is cooking, and doesn’t take up much room. 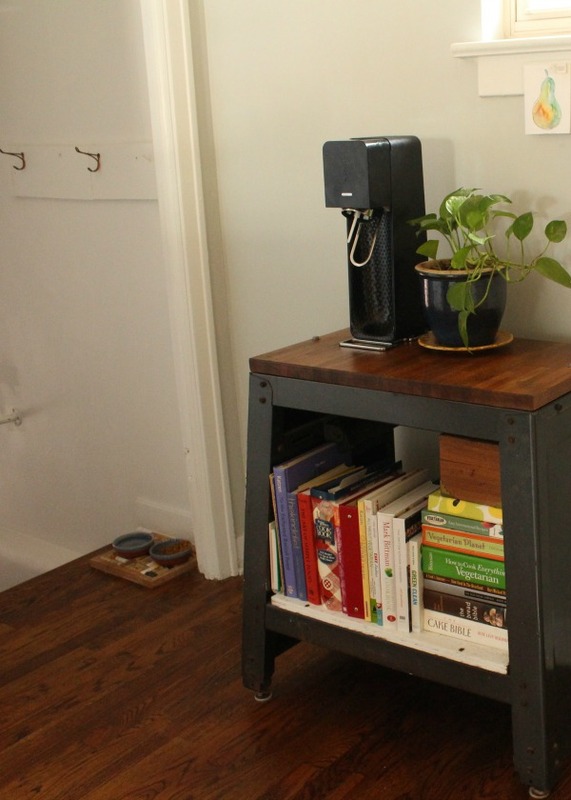 It also doubles as a standing desk, which we’ve loved. Ours is only about 16″ deep, so if you were considering a deeper bar or island, that could make a difference. Good luck with the renovation! In England we have had the new Ikea kitchen range since the beginning of 2014, it’s definitely different, but there are lots of new added extra features and stand alone pantry cupboards that are a great addition. That’s so great to hear, Lizzie! This really turned out as such a personal space. Perfect for the house. I love it – and how the budget/time considerations factored. Great job. 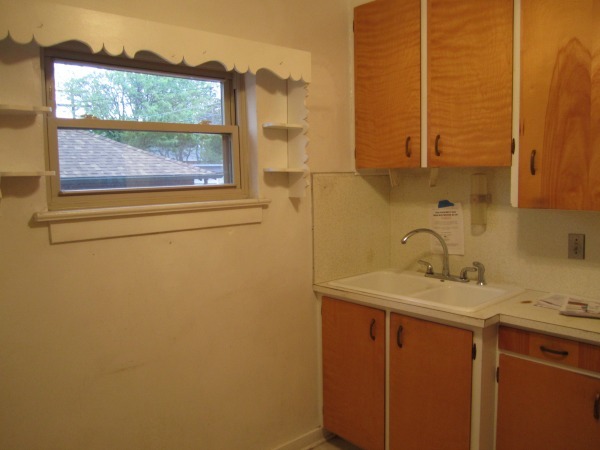 I want to know if they did anything with the sweet little scrolled trim that was around the original window. It looked like someone made it for the window – a cool vintage artifact?! Beautiful! I installed bead board back splash in my kitchen and painted it the same color as the trim. A piece of trim was installed where the wall and counter meet. This might go with your house. But my sink is on an island (thus no backsplash), and my stove is not a slide in (so no backsplash here, either). When I get a slide in stove, I plan on installing a tile backsplash. Please keep the IKEA kitchens coming! They are some of my favorite posts. I love seeing how creative everyone is when customizing. i LOVE the IKEA kitchen posts! My husband and I are in the middle of a kitchen renovation right now and seeing the success others have had is definitely motivation! We are doing 90% of the work ourselves and just finished hanging Sheetrock yesterday! we both work full time so we are doing all the work on the weekends or in the evening after work! I have been documenting and taking pictures along the way and would love to share our story when it is complete! I love your blog and feel we have pretty similar style, so I always look forward to your home/decor posts!